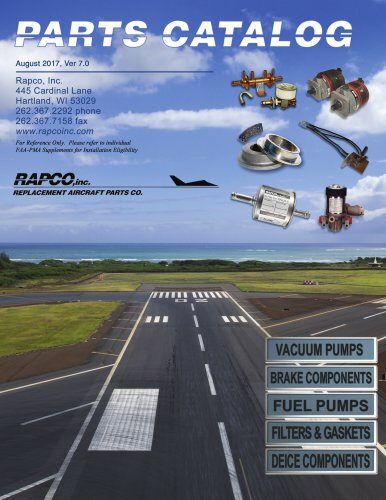 REPLACEMENT AIRCRAFT PARTS CO. See Page 14-16 for complete Cross Reference. REPLACEMENT AIRCRAFT PARTS CO. PNEUMATICS APPLICATIONS Section 3: Dry Air Pump Cross Reference for Kit Plane and Experimental - 2 gyro PNEUMATICS CROSS REFERENCE RAPCO Engine Manufacturer Manifold Check Valves All Airborne pumps available FAA Approved overhauled. For installation eligibility refer to FAA-PMA Supplement.